The Woeful Martin Luther Deception! Our fundamental Bible churches today are filled with ignorant believers who view Martin Luther as a great hero of the faith. Tragically, Martin Luther was a heretic! I realize this comes as a shock to many Christians; but, the proof is undeniable. The Biblical teaching of being saved by faith alone is often attributed to Martin Luther; BUT, nothing could be further from the truth. Indeed, Luther and the other reformers did challenge the Catholic Church that sold indulgences and offered a “works-based” type of salvation. 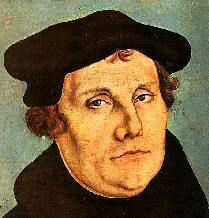 However, just because Martin Luther protested against the Catholic Church doesn't mean that he was saved. Martin Luther often taught that salvation was based on faith alone, and not received based upon a person’s meritorious works; however, Luther’s idea of faith alone does not conform to the Biblical teaching that baptism is not required for salvation. While it is understood that the opinions of men are in no way authoritative when it comes to God’s plan for salvation, it is nonetheless interesting to note that Martin Luther believed wholeheartedly in the necessity of water baptism as a prerequisite for salvation. [I] affirm that Baptism is no human trifle, but that it was established by God Himself. Moreover, He earnestly and solemnly commanded that we must be baptized or we shall not be saved. No one is to think that it is an optional matter like putting on a red coat. It is of greatest importance that we hold Baptism in high esteem as something splendid and glorious. The reason why we are striving and battling so strenuously for this view of Baptism is that the world nowadays is full of sects that loudly proclaim that Baptism is merely an external form and that external forms are useless.... Although Baptism is indeed performed by human hands, yet it is truly God’s own action (1978, pp. 98-99). SOURCE: Luther, Martin (1978), Luther’s Large Catechism, (Saint Louis, MO: Concordia). From Luther’s own comments about baptism, it is clear that he taught water baptism as essential for salvation (the heresy of baptismal regeneration). Many Protestant denominations today have been infected with Luther's damnable heresy. Sadly, most fundamental Bible-believing churches have also been caught up in the woeful Martin Luther deception. Martin Luther was subtle, just as Satan—teaching that salvation is by faith alone, while simultaneously requiring baptism to be saved. Obviously, Luther didn't consider baptism a self-righteous work. The Word of God states in John 3:18, “He that believeth on him is not condemned...” I don't see any mention of “baptism” there. John the Apostle professed in 1st John 5:13 the purpose of his Epistle ... “These things have I written unto you that believe on the name of the Son of God; that ye may know that ye have eternal life.” Carefully notice that John never mentions baptism in 1st, 2nd, or 3rd John. By the way, John doesn't mention speaking in tongues either. Romans 11:6 plainly tells us that if salvation is by works then it is no longer by grace, “And if by grace, then is it no more of works: otherwise grace is no more grace. But if it be of works, then is it no more grace: otherwise work is no more work.” If you add anything to simple childlike faith in Jesus as the Christ, then you have corrupted the saving grace of God and the Gospel. Such is of the Devil. Martin Luther taught works salvation. Every hellbound Catholic today who speaks of faith also believes that salvation comes only through keeping the 7 Sacraments of the Church in Rome. Of course, that is a false view of the Gospel and a road straight to Hell, fire, and damnation. The Apostle wrote 1st John to enlighten us how to KNOW we are saved. It is ludicrous for Charismatics to claim speaking in tongues as evidence of being saved. It is also ludicrous for anyone to claim that baptism is necessary for salvation. If this were the case, then John WOULD have mentioned it. Romans 4:5 plainly states, “But to him that worketh not, but believeth on him that justifieth the ungodly, his faith is counted for righteousness.” There's NO mention of baptism. But our know-it-alls, the new spirit people, claim that faith alone saves and that human works and outward forms contribute nothing to this. We answer: It is of course true that nothing in us does it except faith, as we shall hear later. But these blind leaders of the blind refuse to see that faith must have something in which it believes, that is, something it clings to, something on which to plant its feet and into which to sink its roots. Thus faith clings to the water and believes Baptism to be something in which there is pure salvation and life, not through the water, as I have emphasized often enough, but because God’s name is joined to it ... It follows from this that whoever rejects Baptism rejects God’s word, faith, and the Christ who directs us to Baptism and binds us to it (1978, pp. 101-102). Martin Luther was a heretic! He ignorantly wrestled the Scriptures and believed things about the Bible that were not true. 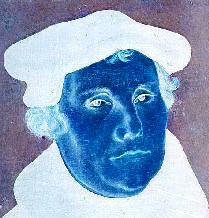 Martin Luther rejected the Book of Revelation because he couldn't understand it. The Biblical teaching of “faith only” which is so often attributed to Martin Luther, has nothing to do with Martin Luther. This is the damnable Martin Luther deception! From the quotes we have read by Martin Luther, it is abundantly clear that Luther DIDN'T believe in “faith only” for salvation. Luther speaks out of both sides of his mouth. Martin Luther’s words are unambiguous and clear—his “faith alone” did not exclude water baptism as necessary for salvation. A. These words tell us: "Given for you" and "Shed for you to forgive sins." Namely, that the forgiveness of sins, life and salvation are given to us through these words in the sacrament. Because, where sins are forgiven, there is life and salvation as well. Luther is teaching Catholic heresy. Salvation is not obtained by quoting “these words in the sacrament.” A person cannot have their sins forgiven through partaking of Holy Mass or Holy Communion, which Lutherans and Catholics believe. In fact, the terms “Holy Mass” and “Holy Communion” aren't even found in the Bible. The Bible teaches the “Lord's supper” in 1st Corinthians 11:20. Also, the term “sacrament” is not found anywhere in the Scriptures. It is manmade tradition, originating in Roman Catholicism. The Lord's Supper, Biblically, is simply a time for a church (local gathering of believers) to REMEMBER the Lord's broken body and shed blood for our sins (Luke 22:19; 1st Corinthians 11:24-25). Biblically, salvation happens the very moment that a person believes on the name of Jesus Christ to forgive their sins (Acts 10:43; John 20:31). There are no required church Sacraments nor rituals required for salvation as Lutherans and Catholics claim. Salvation is of the heart (Romans 10:10). The Lord's Supper is an ordinance started by the Lord Jesus. It is not a Sacrament, nor does it have any special power to it. Their is no grace bestowed as most Protestants believe. There is no efficacy (power) in partaking of the Lord's Supper. The monstrosity of the Holy Eucharist which Roman Catholics teach and practice, called transubstantiation, where Catholics literally think they are eating Jesus' body and drinking His blood, is of the Devil. Lutherans teach and practice a similar heresy called, consubstantiation, where they believe that a special grace is bestowed upon those who partake of Holy Communion. And as you have read, Luther taught that the Holy Communion brings salvation. The Bible does NOT teach any such thing as Mr. Luther claims. The Catholic and Lutheran views of Holy Communion are of the Devil. The Bible simply teaches that the Lord's Supper is a time of REMEMBRANCE in the church, a time when all the gears stop turning to think about how precious the Lord's bodily and blood sacrifice mean to us. It is a time of reflection, honoring our Lord for His sacrifice for our sins. This is quite different than the bizarre and cannibalistic teaching of Catholics that they are literally consuming the Lord's body and blood into their digestive system, thus renewing them with spiritual life. Nor does the Bible teach anything near what Lutherans and Martin Luther claim, that is, that salvation is obtained through Holy Communion. Protestantism is rooted in the teaching of Sacraments, which the Bible does not teach. Water Baptism and the Lord's Supper are simply ordinances to be obeyed by believers who love the Lord and desire to please Him; but they are not mandatory for salvation, clearly evidenced by the plain teaching of the Scriptures. Salvation is coming to God the Father in the name of Christ to be forgiven of one's sins (John 14:6). Jesus Christ is the key to salvation. Do you believe that He is the Christ, the Son of God, and will you receive Him personally as YOUR Savior, Who dies for YOUR sins? Christ died, that's history; Christ's died for me, that's salvation. So many people today ignorantly tout Martin Luther as the great reformer of the “faith only” movement; but, in reality, Luther was a heretic who fathered the baptismal regeneration movement. Luther is tragically burning in Hell. The damnable Martin Luther deception has caused Christians around the world to remain silent concerning the evils of the Lutheran religion. Lutheranism is of the Devil.